I am always on the lookout for sandals/shoes that I might choose to take on a year-long trip. I intend to add to this post as I find shoes that I’d consider for travel. It’s with this in mind that I evaluate any pair of shoes. Most shoes I’d buy in my everyday life don’t even begin to pass consideration for travel. The base beneath our foot is made, they say, from an actual yoga mat material. Yoga mats absorb energy and are comfortable to stand on. 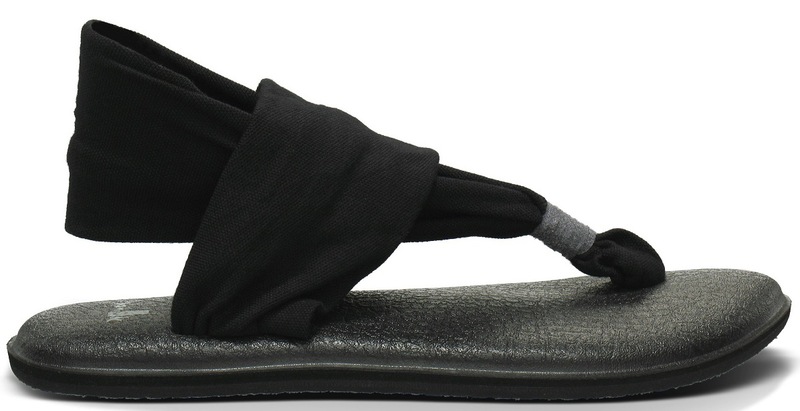 The top of the sandal is a light weight, 2-way stretch fabric. The sling design allows you to have a bit of variety in how well your feet are covered or where you place the straps. They are vegan and vegetarian as well, which is critical for some and simply nice to know for others. Before I visited the Sanuk store, I looked at this sandal online. When trying them, I was happy to discover that the fabric is soft and comfortable. The zigzag pattern of some of the fabric options had made me think the fabric would be an irritating rough weave. I am told they wash well, but I’d like to try that myself a few times. You can learn about this sandal, for now at least, at this web page on the Sanuk site. My thanks to Bobby at the Santa Monica store for helping me get to know both the women’s and men’s line of shoes. He loves the men’s Sidewalk Surfers, by the way. No socks needed. He thinks backpackers would be very happy traveling with them. I’m guessing the women’s would be well liked by women too.